At a meeting last week, a colleague from my consortium's central office showed off a free program he found called Fences. Its function is simple: group desktop icons together in labelled boxes. Of course I like organization, so this appealed to me. This was the first time I'd seen something like this, but it wouldn't surprises me if a similar function was native to OS X or Windows 7 (Fences looks like it's Windows-only). I don' t know that I'd actually use this on my personal computer, but I've been thinking about using this on my library's public workstations. 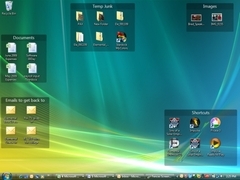 We deliberately limited the number of desktop icons on the public computers to keep things from being confusing and overwhelming. But, if we organize things with Fences, and label each group, we might be able to present more options while still keeping things understandable. 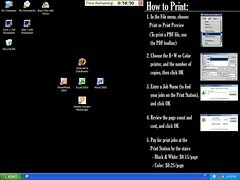 I could see Fences for Microsoft Office programs, Browse the Internet (with a variety of browsers to choose from), Local Websites (maybe the local news sites, Town Hall, the schools), and then perhaps also some to highlight library tools or pages on our website. I obviously haven't finalized things yet, but I like that this got me thinking about a new way to do things. Thanks Tracy! A month or so ago, we upgraded to Windows 7, and thought we'd also change the wallpaper. Our goal in this was to improve patron privacy. The timer software we use is Time Limit Manager (TLM), by Fortress Grand (the little "Time Remaining" clock at the top of the screen above). I like this software because it is very customer service oriented, and patrons don't need to log in with a barcode to start their session - they can just sit down, click "I Agree" to our policies, and go. The timer is basically a courtesy reminder, and for the most part we can get away with using the honor system (TLM does offer additional features for when push comes to shove). But the main problem we were seeing wasn't that people wouldn't leave the computer - it was that patrons weren't ending their session when they left the computer. This set up the scenario where a second patron could come along and just continuing using the session of the previous patron. This never caused a real problem in my library, but the potential was there, so we thought the upgrade would be a good time to address it. The result? Absolutely no change whatsoever. I didn't do a scientific survey, but just from the number of times staff has to end the session at an abandoned computer, the privacy reminder didn't seem to affect anyone at all. I can't believe people aren't seeing this message, so it's tough not to conclude that, at least in my library, most patrons don't care much about their privacy. So, I wanted to ask the question here - what do other libraries do to get patrons to end their session? This is a follow-up post to "Using Firefox On Our Public Computers" - a few people have asked me what else we have on our public computers, so here is pretty much everything we're doing on our public workstations. I'm really curious to hear what other libraries are doing on their public computers, so please share your library's public computer configurations in the comments section. Time Limit Manager - Up until May 2008, we used Library Geek for our timer software. It worked very well for our needs, but it didn't provide statistics. We switched over to Time Limit Manager from Fortress Grand because it accomplished most of what we wanted and gave statistics. We don't require any kind of sign up or sign in, and set the session time for 60 minutes. I should also point out that, as Head of Reference, I am, at best, just a supporting role for computer maintenance. It's the library's Head of Technology that does the hard work, turning what I think patrons might need into things patrons can actually use. I'm lucky to work with someone who puts as much emphasis on customer service as I do - thank you, Barbara.